Couples who twin in matching sweatsuits stay together, right? Well, that at least seems to be the case for Justin Bieber and Hailey Baldwin, who love coordinating outfits. 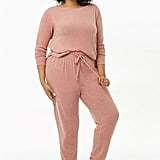 The happy newlyweds were spotted wearing matching baby pink sweatsuits just in time for Valentine's Day while in Los Angeles. Hailey matched her recently dyed locks with a cool Cotton Citizen sweatsuit and Adidas sneakers. Justin, on the other hand, twinned with his SO wearing Billy sweatpants and a light pink hoodie. Read on to get a closer look and shop similar sweatsuits for your wardrobe.